Back in 1982, Ry Cooder asked James Demeter for an amp-style tremolo pedal; the TRM-1 was the result, and ended up on the pedalboards of everyone from David Gilmour to Eric Clapton and Jonny Greenwood. 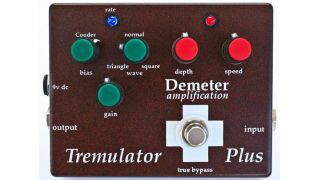 Now, Mr Demeter has updated the concept with the Tremulator Plus. New features include a clock waveform to adjust between triangle, flattened triangle or square wave, while the bias control is now externally adjustable rather than an internal trim pot - this allows users to quickly adjust the pedal's on/off ratio, while pointing it straight up engages the traditional Cooder setting. The Tremulator Plus is handmade in the USA and available now for $299 street.